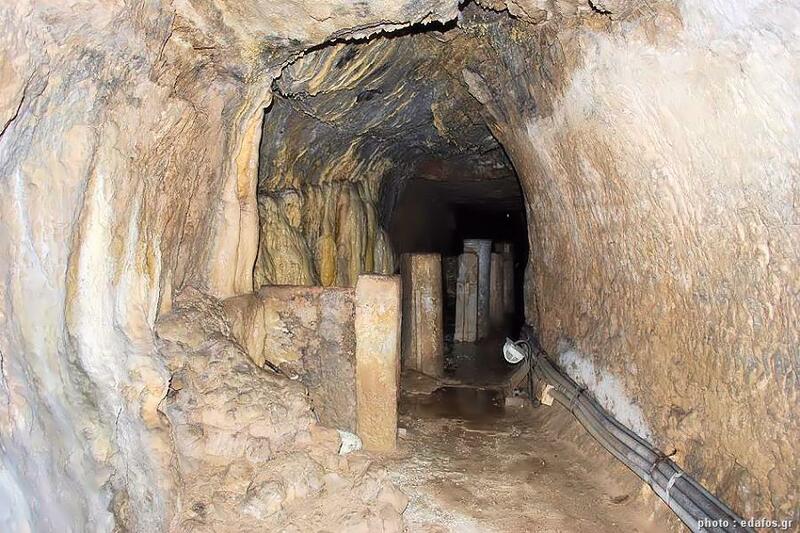 The “Tunnel of Eupalinos” (Greek: Efpalinio orygma, Ευπαλίνειο όρυγμα) or “Eupalinian aqueduct” or “Amphistomon orygma“(= a tunnel having two openings) as Herodotus described it, is an insurmountable task in the history of engineering technology and an important testament of the great engineering skills and knowledge level that the ancient Greek engineers possessed. The project took place in the second half of the 6th c BC by the engineer Eupalinos of Megara (in west Attica), during the period of Polycrates tyranny. 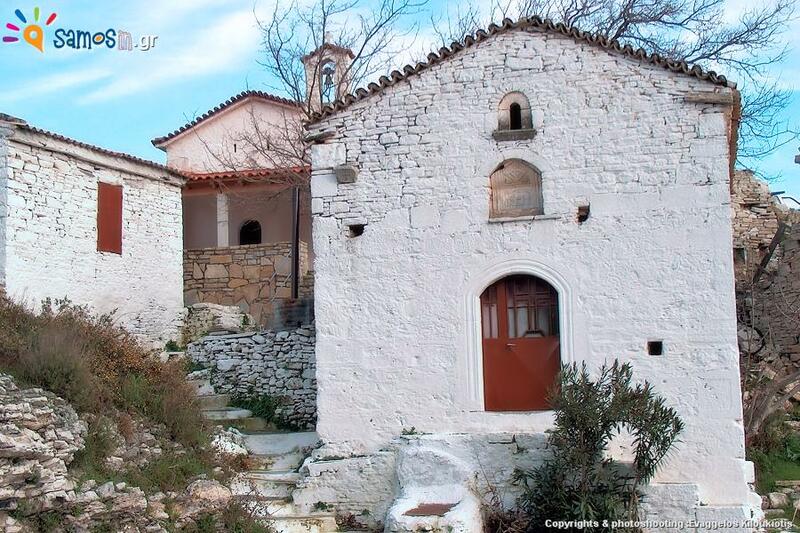 The aim of the project was to supply water from the source of “Agiades”, (hidden at the mountain away from enemies), to the ancient city of Samos, through mount “Kastron”. The result was a remarkable water pipeline, total length 2,385 meters, of which 1,035 passes through the tunnel. The water pipeline starts at the water source, for the first 600 m, in depth of 2.5 meters with constant 0.6% grade, and then it continues for the next 260 m with a constant 0.75% slope. This section was constructed by connecting the bottoms of five wells. Then the conductor pipes enter a 1.035 m long tunnel, perfectly horizontal (the northern mouth is located at 55.48 m height and the southern at 55.17 m height). 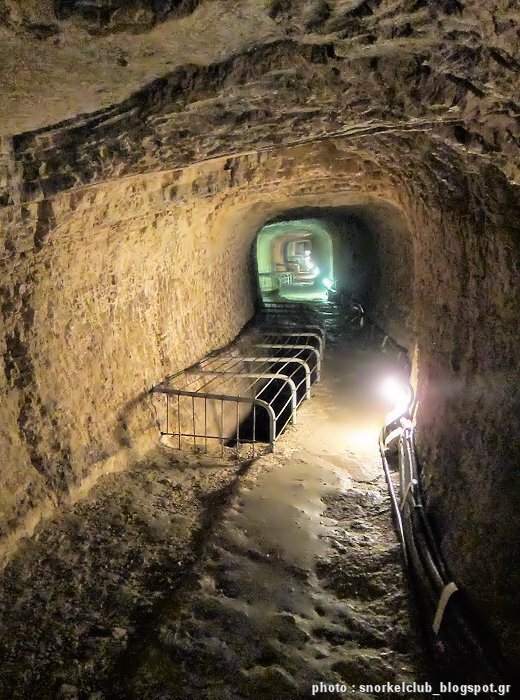 The tunnel has dimensions 1.80 x 1.80 m and at the floor lies a ditch (inclined), 0.6 m wide and up to 10 m depth, in which they placed clay cylindrical tubes (cut in half) 0.40 m wide, from where the water passed. At the southern mouth of the tunnel, and for the remaining 490m, pipes directed the water into the city reservoir. To save time, the construction of the tunnel took place with the simultaneous work of two working groups, one from the north and one from the south and they managed to meet each other in the middle, at a depth of 180 meters from the top of the mountain. The aqueduct was the work of Eupalinos, son of Naustrophos, an engineer from Megara. Its construction started in 550 B.C., during the tyranny of Polycrates and lasted for ten years. Many slaves (mainly from Lesvos Island) were used by the Samians for the completion of the work. For the completion of this project many problems had to be solved. Amongst them intractable geometrical problems (determination of altitudes, slopes, setting out the horizontal plane and more), since the knowledge of geometry was still limited and the surveying instruments unknown. Therefore it’s still riddling, as to how they managed to find solutions to all these difficulties. There were also other solutions, simplest, cheapest and equally safe for the construction of the aqueduct, still it is said that Polycrates chose this innovative and unique approach, desiring to impress, show his wealth, power and greatness and at the end he succeeded. The aqueduct was used for about a thousand years, although during the Roman era, a new aboveground aqueduct using arches was built, from “Megali panagia” monastery to the city, with a total length of 15.5 km. 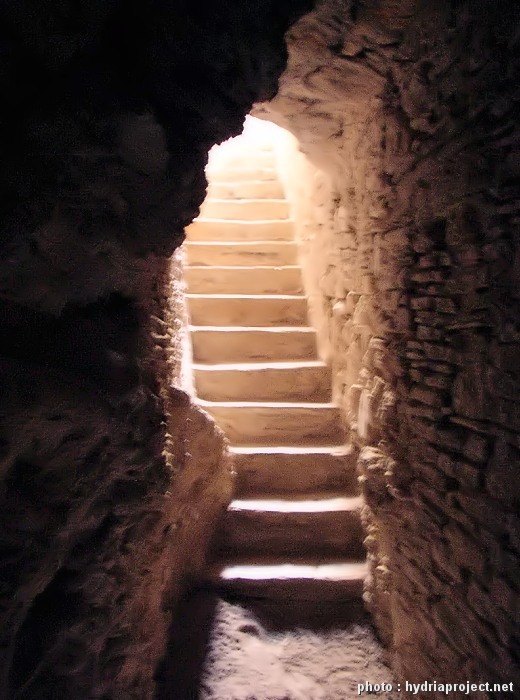 As proved by the archaeological findings, the tunnel was known until the 7th c AD, but from there on there was no reference to it anymore, and it was forgotten. Several archaeologists searched for the tunnel later on, according to the references made by Herodotus, but without positive results. Finally, the northern mouth of the tunnel was discovered accidentally in 1872, by Cyril Moninas, abbot of Agia Triada monastery. The southern mouth was discovered in 1874 by Theofanis Arelis, abbot of Timiou Stavrou (Holy Cross) monastery. The successor of Cyril, monk Synesios Giannou, managed to cross the whole tunnel and wrote in 1899 “Treatise of Efpalio tunnel”. Tunnel of Eupalinos classified World Heritage Monument by UNESCO since 1992. Ιntegration within the wider region of Pythagoreion. 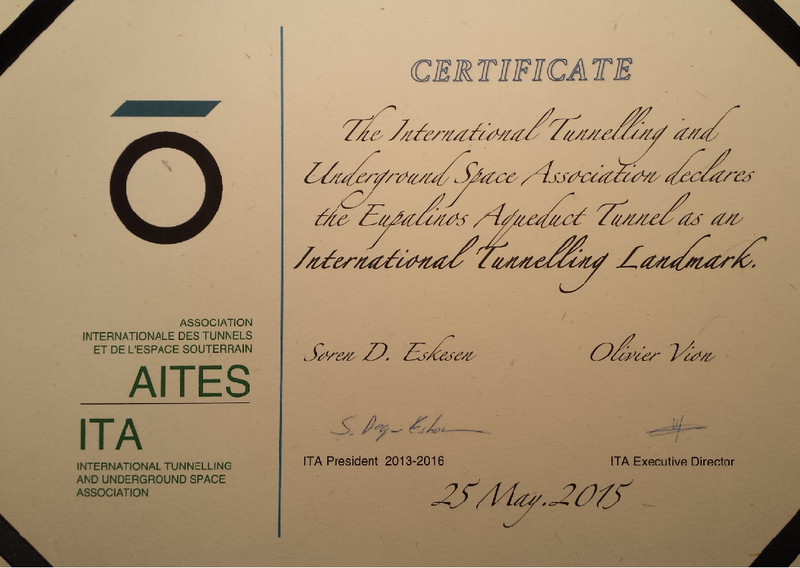 At the “World Tunnel Congress 2015” Conference in Dubrovnik, Croatia on 25 May 2015, the Tunnel of Eupalinos was proclaimed International Tunnelling Landmark by the International Tunnelling & Underground Space Association (ITA – AITES), and handed over to the Greek Commission for Tunnels & Underground Projects .E.E.S.Y.E.) 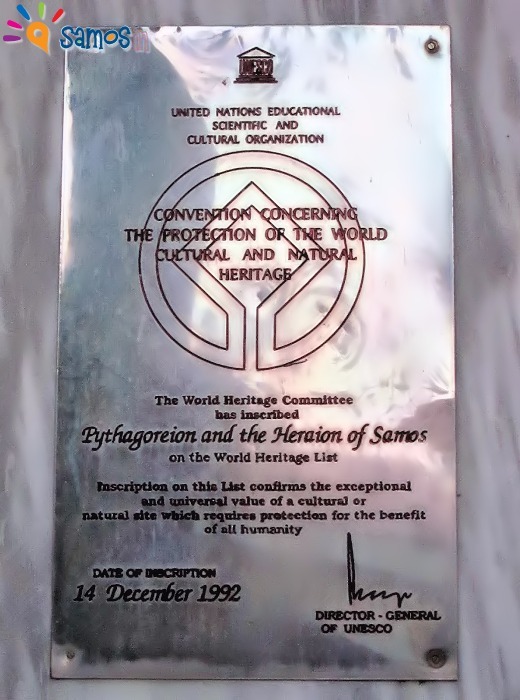 Special plaque and certificate honorary. It is noted here that this was the first time – internationally – that this title was institutionalized. 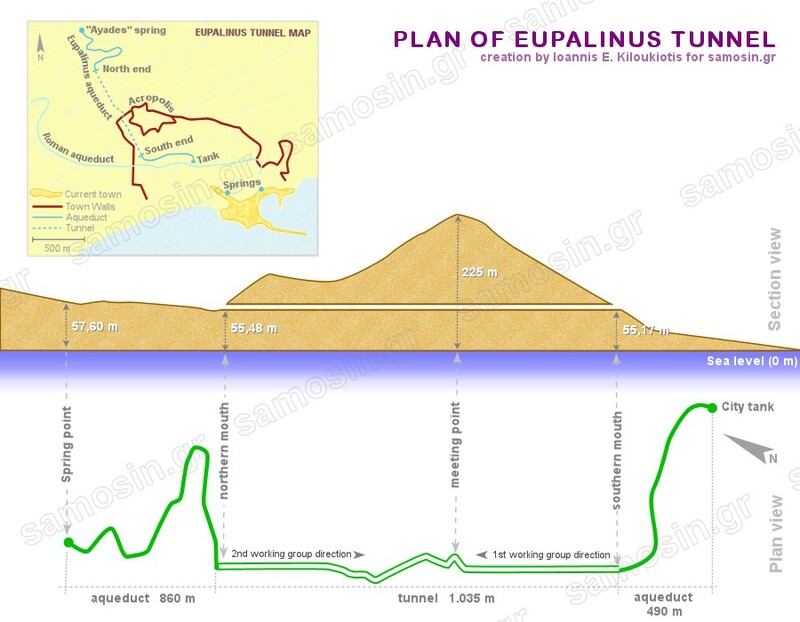 At 2017 the American Society of Civil Engineers (ASCE) recognized the Tunnel of Eupalinos as an “International Historic civil engineering Landmark” and at a ceremony held at the Tunnel at 29/10/2017 a special plaque was posted. there are 3 ways to visit the Tunnel. Itinerary 1. Length 185 m., maximum number of visitors 20, duration 00:20΄ including return. In this part one can see all the construction details. Difficulties : a narrow stairway with steep, tall steps and a low and very narrow corridor 17 m. long, 1,55 m. high, 0,55 m. wide. Fairly easy after the corridor. Itinerary 2. Length 424 m., maximum number of visitors 15, duration 00:40΄ including return. Visitors should book in advance date and time by phone: +0030 22730 62813. 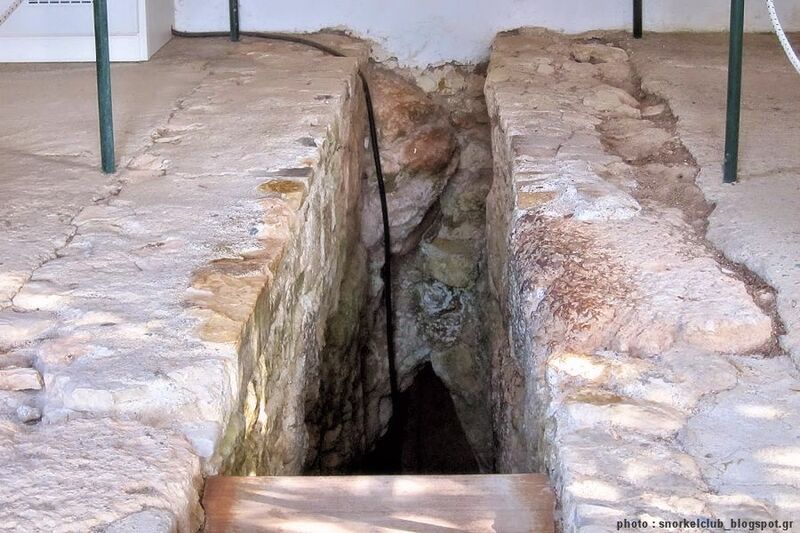 One can see a cistern of byzantine period and the meeting point of the two working groups. Difficulties : All the above mentioned and rocky, uneven floor, wet and slippery in some areas, and water dripping from the ceiling in some parts. Itinerary 3. Length 1036 m., maximum number of visitors 10, duration one hour, one way. 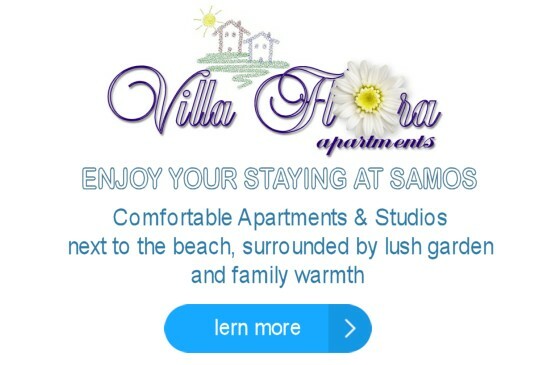 Visitors should book in advance date and time by phone: +0030 22730 62813. 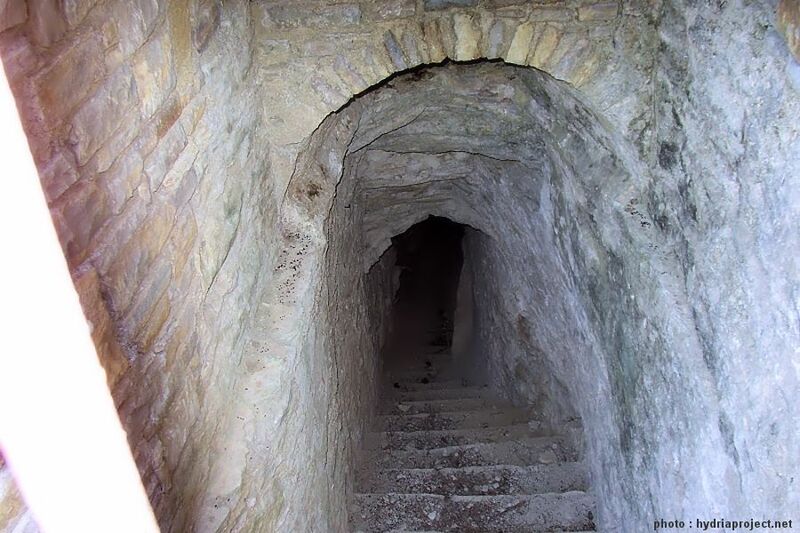 One can see the whole tunnel and visit the spring and the cistern in Agiades. Difficulties : All the above and fatigue. 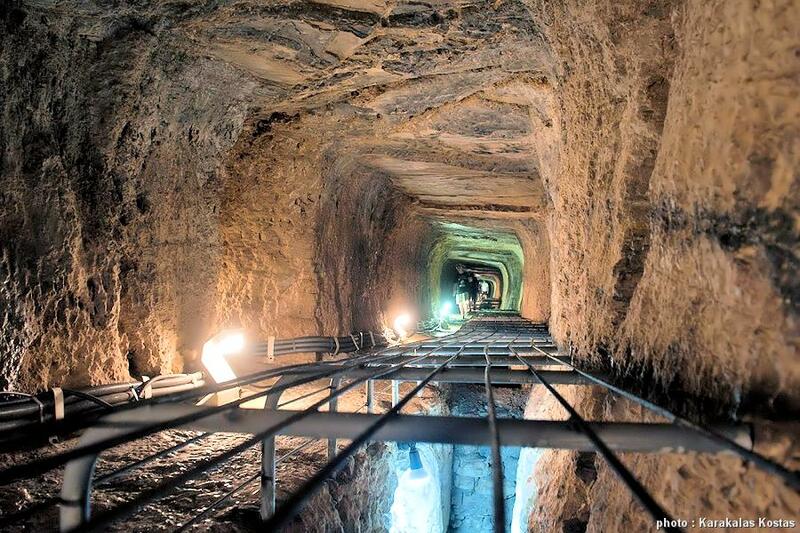 Especially difficult is the passage through the north low, narrow corridor 197 meters long, 0,42 – 0,60 m. wide. There are neither facilities, nor public transport from the north exit to the city. One has either to have prearranged for a car to wait for him, or to walk for about 00:45΄ minutes through a dirt path in order to reach the city of Pythagoreion. Visiting hours: At 08:30΄ from the South Entrance, 09:20΄ from the North Entrance, 10:20΄ from the South Entrance, 11:20΄ from the North Entrance, 12:20΄ from the South Entrance, 13:20΄ from the North Entrance. The tunnel is 1036 m. long. 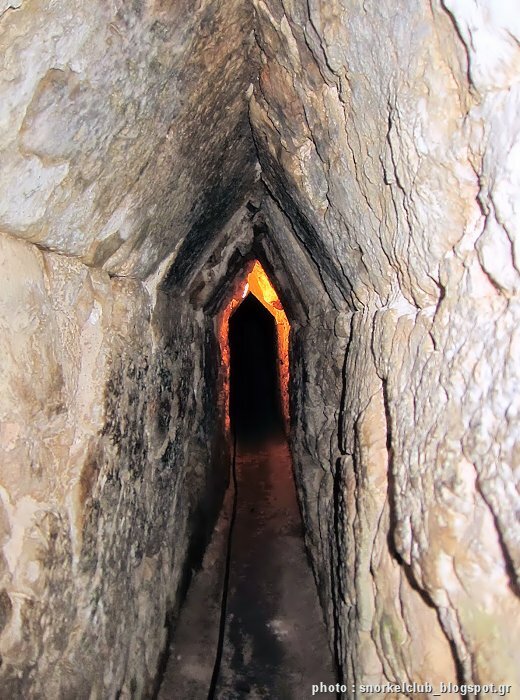 The average dimensions are 1,80 m high and 1,80 m wide, but in some parts the height is as low as 1,50 m. and the width is as narrow as 0,42 m.
The rocky, uneven floor is wet and slippery in some areas and from the ceiling is dripping water in some parts. The temperature is 16,5 – 16,7°C (degrees Celsius) and the humidity is 85 – 97%. Therefore overweight people, visitors suffering from claustrophobia, panic attacks, lumbago, cardiac or respiratory problems, spinal diseases, musculoskeletal disorders causing moving difficulties are strongly advised not to enter. Visitors who, after the above, decide to visit the Tunnel, they will do so on their own responsibility. In case of an accident the Greek State will bear no responsibility. Visitors must not carry big bags; they should leave them at the entrance of the tunnel. Visitors doing the Itinerary 3 cannot carry any bags at all. All visitors must wear protective helmets (provided) and closed flat, non slippery shoes. They should be in the entrance 00:10΄ earlier to wear their protective helmet. For the present children less than 14 years old are not allowed inside the Tunnel. Young people between 14-18 years of age should be accompanied by a responsible adult. Guides must talk about the history of the Aqueduct outside the Tunnel. Inside the Tunnel they can only point out areas of interest. Photography with a hand-held, non professional camera is allowed free of charge but the use of flash is forbidden. Professional photography or video are not allowed without a special permission issued by the Hellenic Ministry of Culture and Sports. Students of University – Higher Education Institutes. For some Itinerary at the Tunnel, visitors should book in advance date and time by phone: +0030 22730 62813. Please see the text above, with routes and hours of visit.